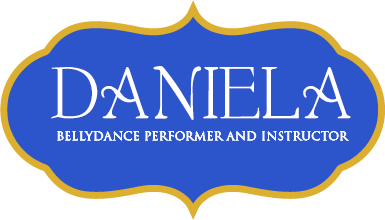 Daniela offers many performance packages to suit any event. Below is a list of packages that Daniela offers. Don't see what you are looking for? Please email Daniela with your requests, and she will be happy to work on customizing a performance package with you. *Please note, these are base prices and may be increased due to travel expenses or other variables. Sorry, but Daniela does NOT perform at bachelor or all-male parties. ​A bellygram is a short show, affectionately called a “hip and run”, consisting of an entrance with finger cymbals, a veil dance, a drum solo, and audience participation, where Daniela will get everyone up and dancing before making her exit. This show is a great way to liven up any party! This is a longer show, consisting of an entrance with finger cymbals, a veil dance, an audience participation section where the guest of honor becomes part of the show, a sword dance, a drum solo, and a grand exit. This show gives guests a true taste of the Middle East, and is perfect for any occasion! This is a full-length bellydance show, consisting of all of the elements of the shorter packages, plus a slow, mesmerizing taqsim performance and an additional audience participation section before Daniela's exit. This package is great for bachelorette parties, bridal showers, weddings, etc. Daniela will perform her 20 minute routine (listed above) and then teach your guests a few bellydance moves that they can put to use on the dance floor! The guest of honor gets a complimentary hip scarf to take home! This interactive performance is always a hit! ! ​Perfect for weddings and corporate events, this all-inclusive package will give you the flexibility and extra peace of mind that is sometimes needed for these larger-scale events. No need to worry about late fees - Daniela will remain available for up to 2 hours after her scheduled performance time, to account for any unforeseen delays or schedule changes. This package also includes one pre-event site visit (subject to any applicable travel fees) so that you and Daniela can plan the perfect performance to suit your event and venue needs. The Professional Bellydance Routine is included in this package, but longer shows can be substituted for an additional fee. Perfect for bachelorette parties and bridal showers, this one-hour class will introduce your guests to the basics of bellydance. Everyone will learn a short routine, and the guest of honor gets a souvenir hip scarf to commemorate the event! Price: starts at $25 per person, with a minimum of 8 people. Email Daniela for more pricing options.